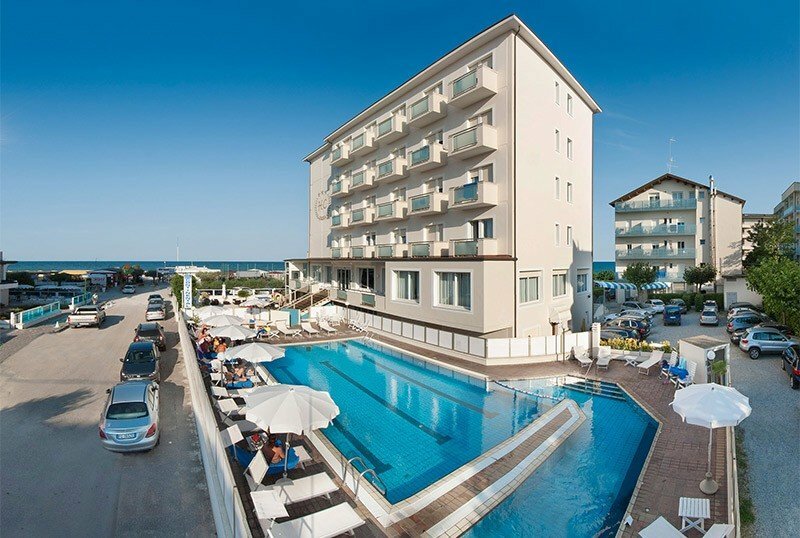 The Hotel Continental is a 3 star hotel in Milano Maritima managed by the owners and located in a convenient position, facing the sea and with no roads to cross. It offers a large heated swimming pool with Jacuzzi, solarium and garden, as well as parking, air conditioning and WI-FI throughout the building. No pets allowed. The Hotel is located on the seafront, with no roads to cross. The pine grove of Milano Marittima, cool and shaded, is only 5 minutes walk away and in about 15 minutes walk you can reach the center and the canal harbor, where most of the shops, pubs and restaurants are concentrated. All rooms have a balcony with sea view, satellite TV and digital terrestrial, air conditioning (with charge), WI-FI, safe, telephone and bathroom with box or shower curtain and hairdryer. The minibar is available on request at an extra price. FAMILIES : The room types are: double, triple, quadruple, single and 3 apartments consisting of 2 connecting rooms. Garden with ping pong tables and games, heated swimming pool with Jacuzzi, sun terrace, reading room, satellite TV room, bar, free use of bicycles, beach towels, newspapers, laundry service (surcharge). BREAKFAST : international buffet breakfast with sweet and savory dishes. LUNCH AND DINNER : every day regional, Italian and international dishes with 3/4 menus of first and second choice with a buffet of vegetables, salads and homemade desserts. Water, wine and juice at meals in every accommodation package. VARIATIONS : the menu is suitable for vegetarians and celiacs. In the hotel : strollers, children's pool and playground areas in the garden and inside the structure. Baby sitter and pediatrician services are available for a fee. In the room : cots with extra charge. At meals : seats at the table and ready meals. For all guests there is a large heated swimming pool (27 ° / 28 °) with a hydromassage and a shallow area for children. The sun terrace is surrounded by sun loungers and parasols where aperitifs and cocktail parties are set up. - up to 5 years: promotions available, request a quote. 1st child up to 12 years FREE! 2nd child up to 12 years -50%! Half board, full board or all-inclusive. Minimum 6 days. Accommodation in room with 2 adults. CHILD UP TO 4 YEARS: FOR FREE, minimim 3 days, in room with 2 adults.